Cuomo: "Ultra-conservatives in Washington have declared war on New York's health care system." New York State Governor Andrew M. Cuomo. 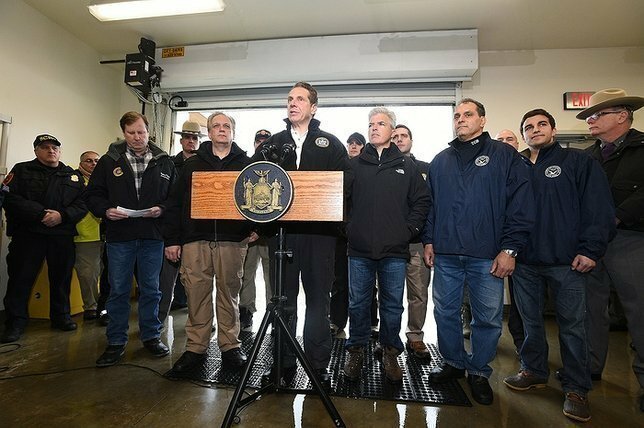 Photo by: Kevin P. Coughlin/Office of Governor Andrew M. Cuomo. "The Congressional Budget Office's report confirms what we already knew to be true—ultra-conservatives in Washington have declared war on New York's health care system. What's worse is that Republican members of our own Congressional delegation have aided and abetted in Washington's war against New York, cutting taxes for millionaires while jeopardizing care for seniors, women, the middle class and the disabled. "The radical Republican health plan will devastate New York's health care system, strip 2.7 million New Yorkers of their health care coverage, and roll back the progress we have made to protect vulnerable Americans. This bill will cost New York State a total of $6.9 billion, including $2.3 billion as a direct result of the disastrous amendment introduced by Congressmen Faso and Collins. "As radical ideologues race to impose their extremist agenda on Americans, New Yorkers say no. In New York, we will stand up for our progressive principles and protect the right to affordable and quality health care for all. I will continue to work with our Congressional delegation and New York's health care leaders to defeat this reckless legislation." The plan will leave 2.7 million New Yorkers without health care coverage. It will cost New York a total of $6.9 billion. It will put at risk a total of 7 million people who rely on Medicaid services and other programs created under the Affordable Care Act. And it threatens the entire New York State health care system, which serves 19.5 million New Yorkers. It will cut $2.3 billion in Medicaid funding to the State. Steep cuts would force New York State to increase taxes, slash coverage to millions of New Yorkers, or devastate health care providers. New York requires that all commercial insurance policies cover abortion services. In January, Governor Cuomo took new action to ensure that contraceptive drugs and devices are covered by commercial health insurance policies without co-pays, coinsurance, or deductibles. The Republican health care bill would prohibit the use of tax credits to support the purchase of insurance plans that cover abortion services. As a result, the bill would effectively defund the Essential Plan, forcing 685,000 low-income people, half of whom are women, to lose their insurance and denying them $1.5 billion in tax credits. In addition, roughly 143,000 lower-income New Yorkers whose income is just above the threshold for the Essential Plan, half of whom are women, would be denied $400 million more in tax credits that help them afford insurance. In New York, 8.4 million people under the age of 65 have preexisting conditions. The MacArthur amendment would allow states to opt out of provisions that restrict providers from raising prices on people with preexisting conditions. Removing protections for people with pre-existing conditions will result in the sick paying high premiums and would force those who cannot afford it to lose coverage. The health plan would also permit states to charge older people more, which would also force people who cannot afford it to lose coverage. Mangano Declares "Women's Lung Health Week"
Subject: LongIsland.com - Your Name sent you Article details of "Statement From Governor Andrew M. Cuomo On The Congressional Budget Office's Score Of The American Health Care Act"